Valentine, you’re totally my jam. Makes 40-50 cookies, depending on the size of your cutters. 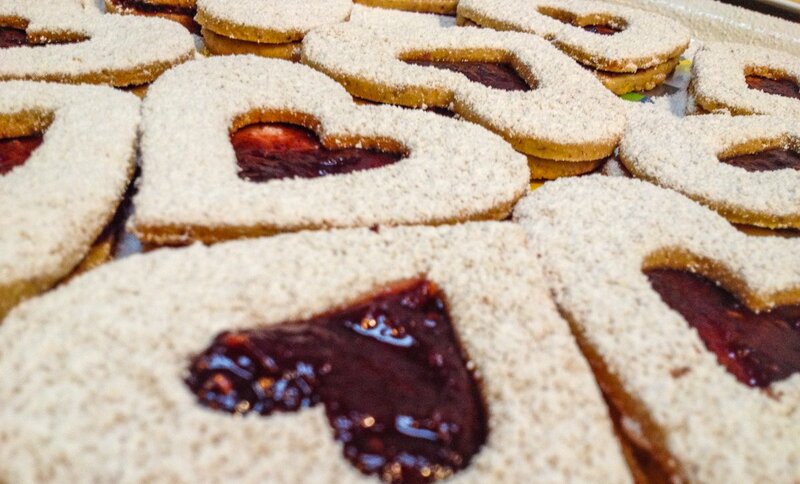 For this recipe, you will need 2 sizes of heart-shaped cookie cutters. Plop the hazelnuts in your food processor and finely grind. Combine hazelnut, almond, and all-purpose flours plus baking powder, cinnamon, cloves, and salt. In a stand mixer (or handheld beaters), cream together butter and sugar until light and fluffy – this will take a few minutes. Add 4 eggs, one at a time, combining well after each addition (and scraping down the sides of the bowl) to make sure all of your ingredients are incorporated. Line your cookie sheets with parchment. Cut all the dough with the larger of the heart cutters. Next, cut half of the cookies as “window cookies,” using the smaller cutter to make the window. The small little heart cookies that result from the “windowing” – you can use for another time. Brush with the egg wash and bake cookies until nice and golden brown. Assemble by spreading raspberry preserves between two cookies (one regular cookie and one window cookie). Beautiful and delicious! 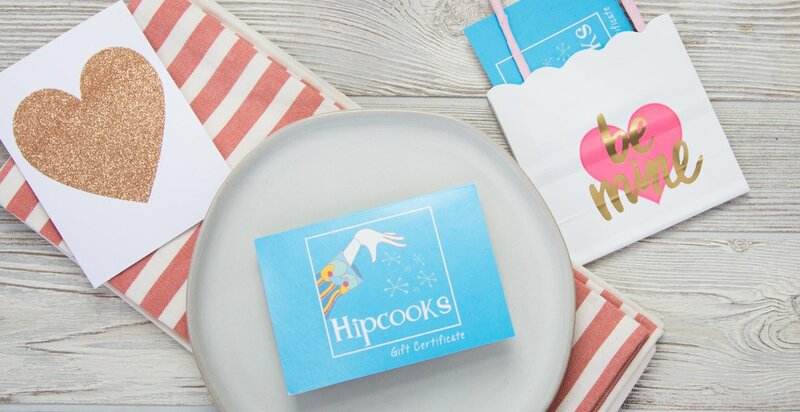 Our Gift Certificates never expire & if your Gummy Bear is well, shall we say, challenged in the kitchen, then Hipcooks is a super-fun way to inspire & engage. Hipcooks students love to practice on their Best Beloveds, so it’s a win-win for you, Cookie.